On to the mountain! The first contact to our guides in the hotel yard is somewhat discouraging. The lead guide, Babuu, seems distanced and just a bit too cool. His second, Mr. Mango, is very quiet so we cannot quite tell whether he actually understands a word we are saying. He’s got badly discolored teeth and a crippled hand. Both are young. We are a bit anxious and have lots of questions which only receive very superfluous answers. Fortunately initial perceptions were misleading and in the end both turned out to be exceedingly strong, competent and very friendly companions. We are told to pack two packs, a daypack we’ll carry ourselves with no more than 10kg and a pack for the porters with no more than 15kg. Volker has a hard time staying within these limits and only calms down when he realizes that he cannot actually physically wear six jackets at the same time which he originally intended for summit day. He leaves some at the hotel ;-) Anita and I travel the most lightly with 14kg total each. 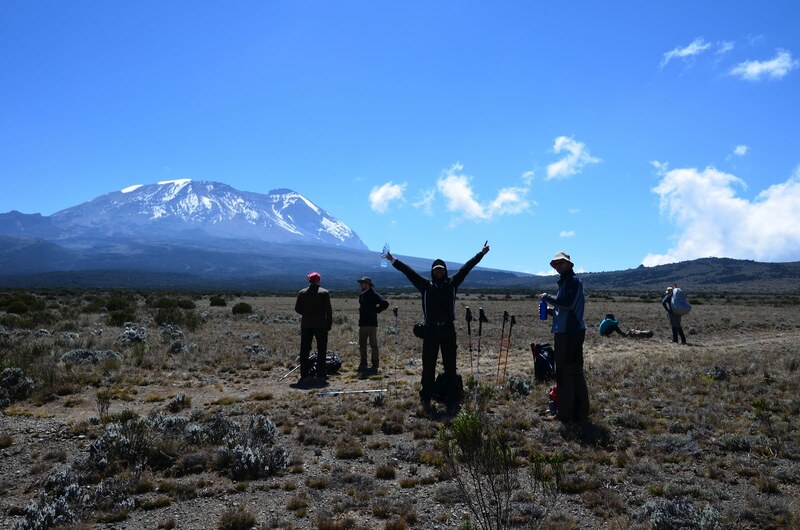 I think it shows that we are the most outdoor experienced of the group and have a pretty good idea of what’s essential. The packs for the porters get stuffed into huge plastic bags which they’ll later carry on their heads. Even if you give them a perfectly fine backpack they’ll wrap it and put it on their head. Quite a funny sight to behold. 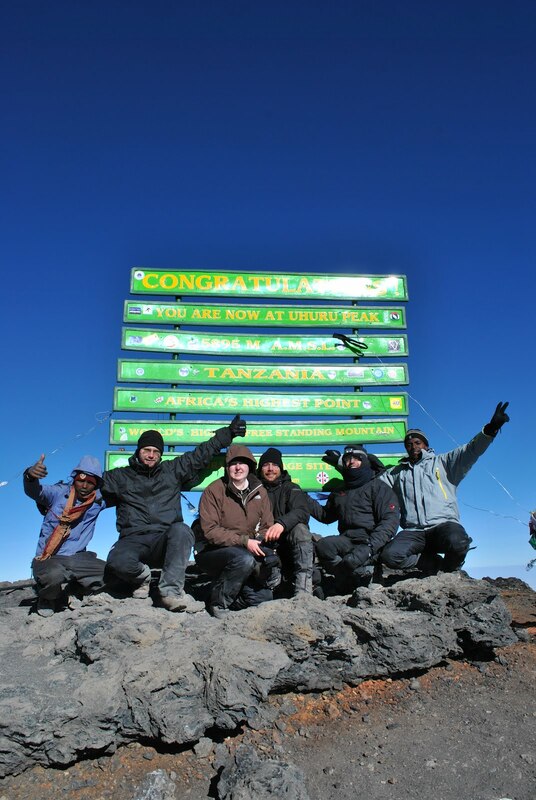 We have chosen the eight day Lemosho trek to the top. 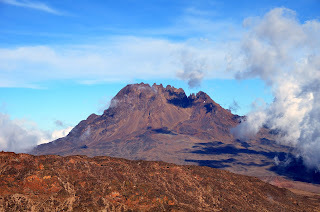 It’s the longest route, allowing for the best acclimatization and thus the best chances of success. It’s also the most scenically beautiful and less crowded route. Especially compared to the “Coca-Cola” route, which features huts for accommodation. There’s also a hard and fast “whiskey” route which is only recommended if you already arrive pre-acclimatized. 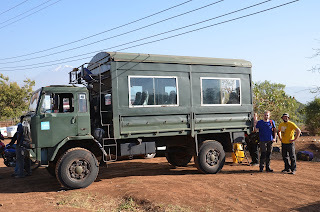 We reach the trailhead at around 2000m in a special off-road military type truck with huge tires. The vehicle was sorely needed as the road up there is quite an adventure. There’s big chaos at the official park entrance and registration point where the luggage gets weighted and distributed to the various porters. Babuu hires more freelance porters hanging around waiting for jobs. It’s a mystery to me how nothing gets lost in the shuffle, but it all turns out as it should. 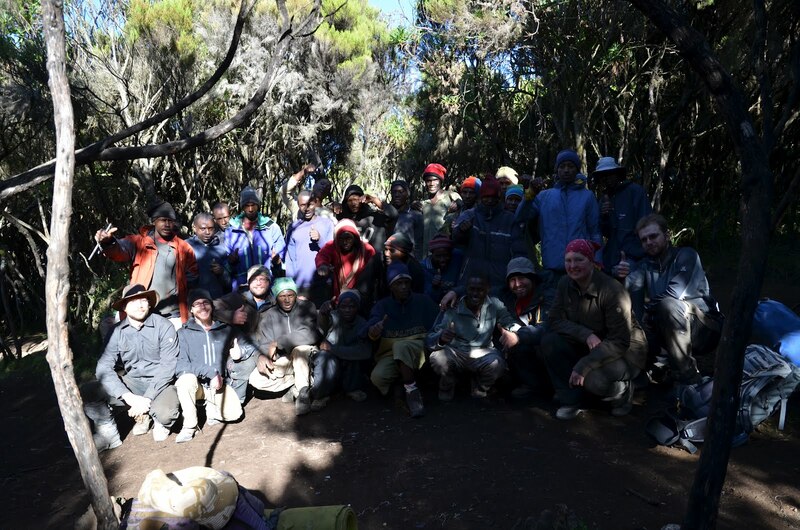 We end up with a support crew of 23 people: 18 porters, 3 guides, a chef and a waiter. Although we’ve been warned that we needed to hire this many and are not allowed to go without it’s still quite a crowd to behold. We start out through rain-forest with lots of reminders to go “pole, pole”, which means slow slow. Aside from seeing some monkeys it’s beautiful but pretty uneventful. 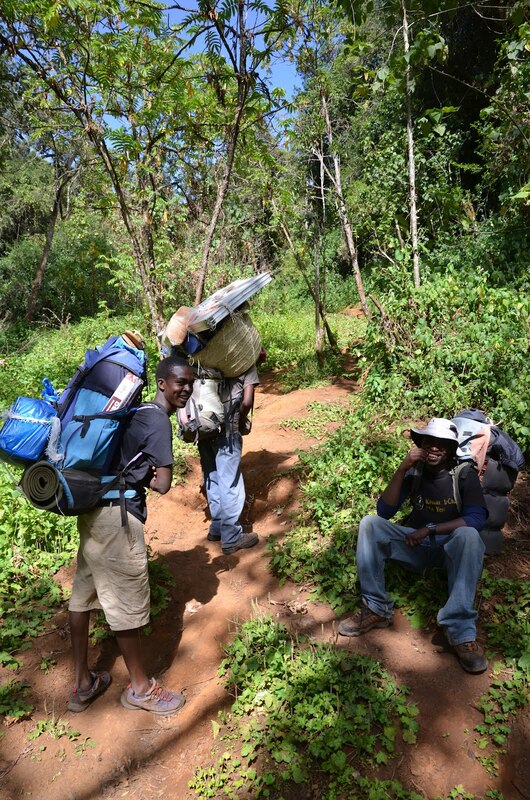 We hardly ever see our porters, a rhythm which should become the norm over the following days. 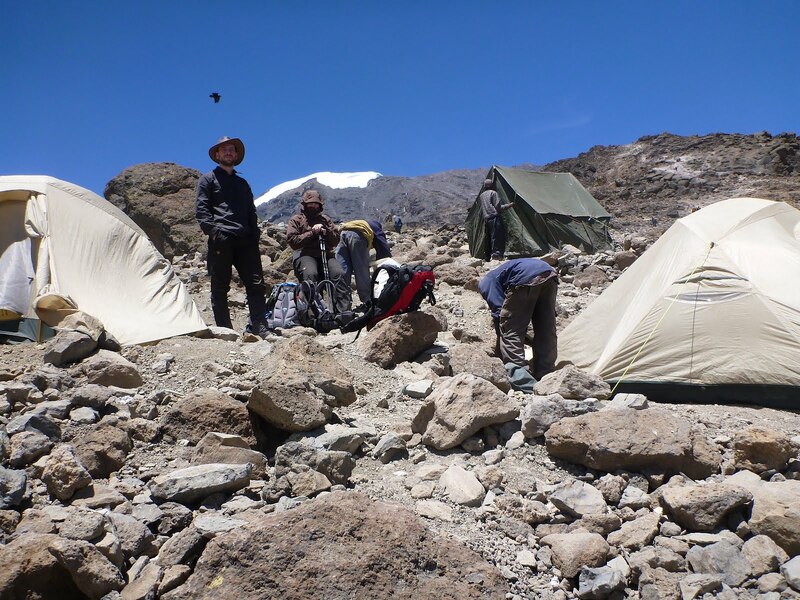 We’d leave camp in the morning, the porters would deconstruct it in our absence, hurry past us during the day and set up camp again before we arrived. They must be some kind of superhuman species. Many of them clad in clothes barely a level above rags, t-shirts and shorts, naked feet in sandals but literally running up the mountain at altitudes above 4000m carrying a full 20l canister of water on their head and a backpack on their back. They also didn’t seem to eat, sleep or drink. Seriously. 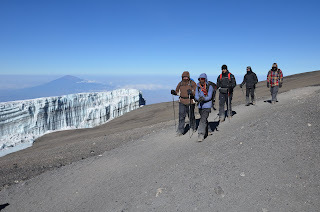 While we were constantly reminded to drink at least 4 litres of water every day to combat altitude sickness and stay in good health they hardly ever carried drinking bottles at all. While we slept in good expedition type tents they shared the single skinned kitchen tent made from cheap plastic canvas. Tough as nails and cheerful and friendly to boot. Unfortunately very few of them understood any English, so conversation was hard to impossible. 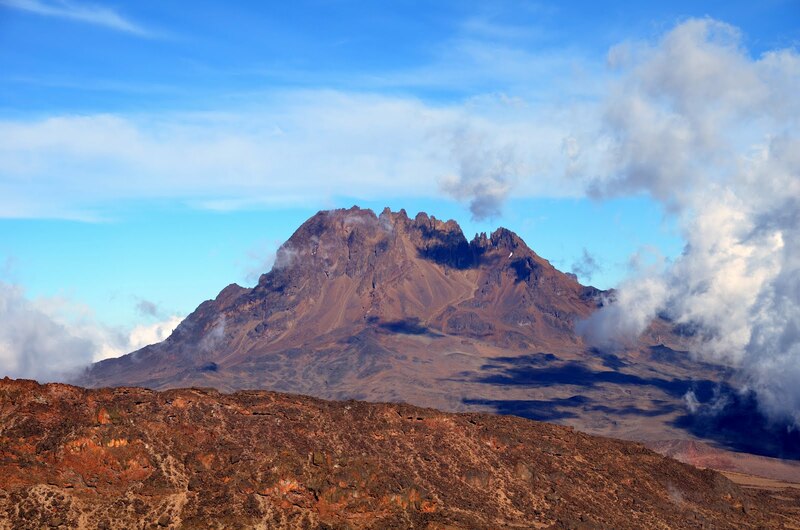 The next acclimatization tour leads us to the Lava Tower, a 4560m high needle of rock. It’s the first day the altitude is starting to have an effect and some of us suffer from head aches. It’s the first and only time on the mountain I take an aspirin against the pain. Our next camps will all hover around the 4000m line, which, believe it or not, in these degrees of latitude is also where vegetation stops. We are traversing around the mountain. Doing so we converge with several of the more popular routes and it starts getting crowded. There must be hundreds of tourists on the mountain at any given moment. This implies at least 3-4 support personnel per tourist and thus thousands of people. 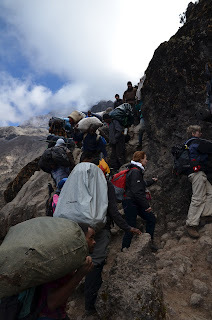 Leaving Barranco camp at 3950m climbing the “breakfast wall”, a steep section of rock that acts as a natural choke point, looks like an ant trail of porters and climbers. We arrive at Barafu camp at 4600m. This is our final camp, we will wake up at 23:15 in the evening to start our summit attempt. 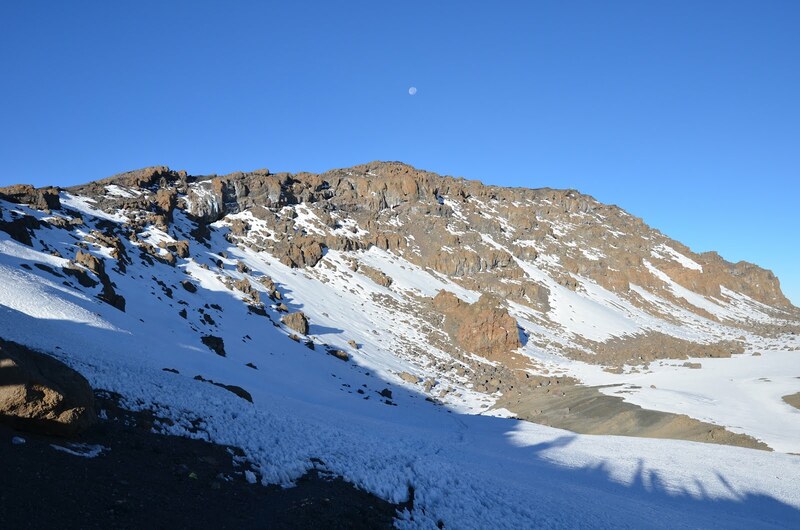 Weather thus far has been perfect with a stable rhythm of clear nights with a full moon followed by a bright and cloudless sky until the afternoon when the moisture would rise and form some cloud cover. No rain, no high winds. At this altitude we aren’t really expected to sleep. Oxygen content is at about 60% sea level and you notice it in everything you do. Get up too fast, get a headache. Walk a couple of fast steps, become short of breadth. Lie down to sleep and relax and feel your heart racing and your lungs labouring much harder than usual. Four of us head out and up for another acclimatization climb of 200m before going to bed. We visit the deserted Kosovo camp (it’s not being used any more because of high winds). 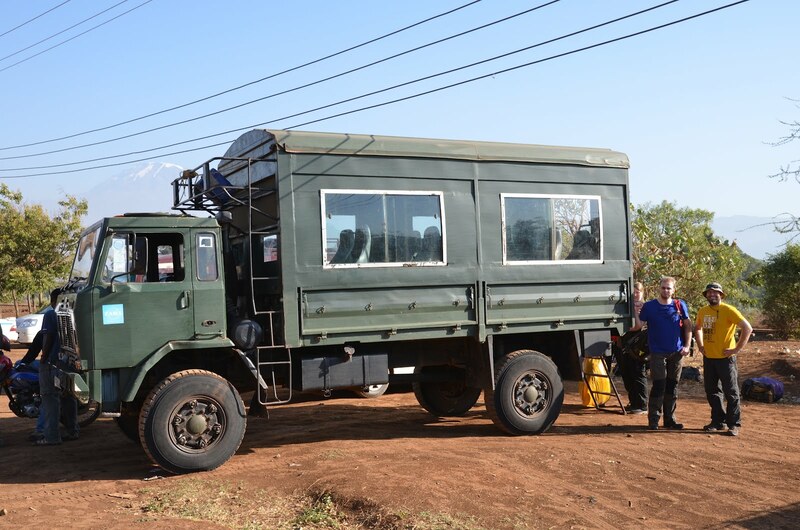 Insane fact: For Barafu camp the last source of water is 800m lower. This means porters are constantly running up and down fetching water for cooking/washing/drinking. You just have to admire these guys (and two girls! 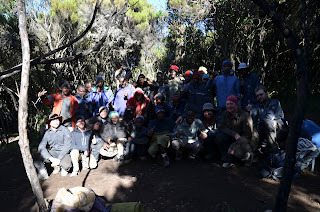 from all the porters we saw we’ve met only two females). Go! Everybody dons pretty much every layer of clothes available and we head out. First in the light of our headlamps, then, noticing that the full moon shines bright enough, only in the pale glow of the moon. A long line of fellow climbers snakes up the mountain like a line of fireflies. For every two of us there’s one guide, prepared to help anyone down on short notice. Failure is a very real possibility. 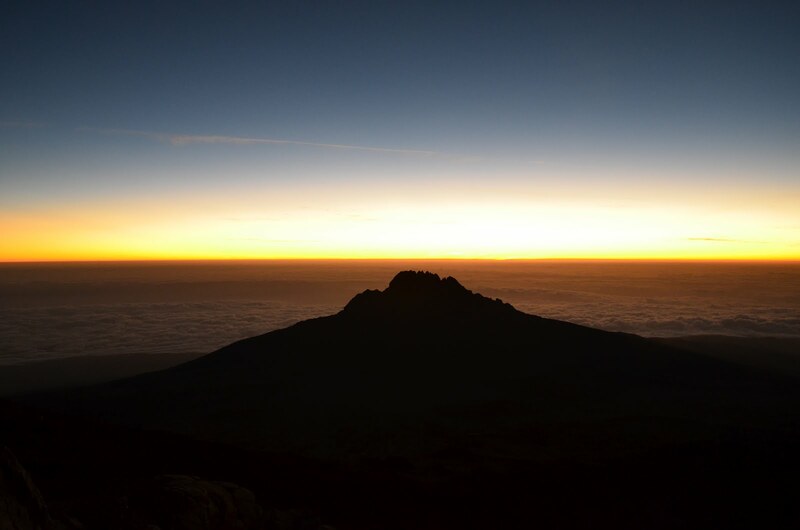 We’ve witnessed a helicopter rescue the day before and seen four porters more or less carry down a client who was stumbling blindly and drunkenly with blood from his nose. Right from the start people are passing us going down. 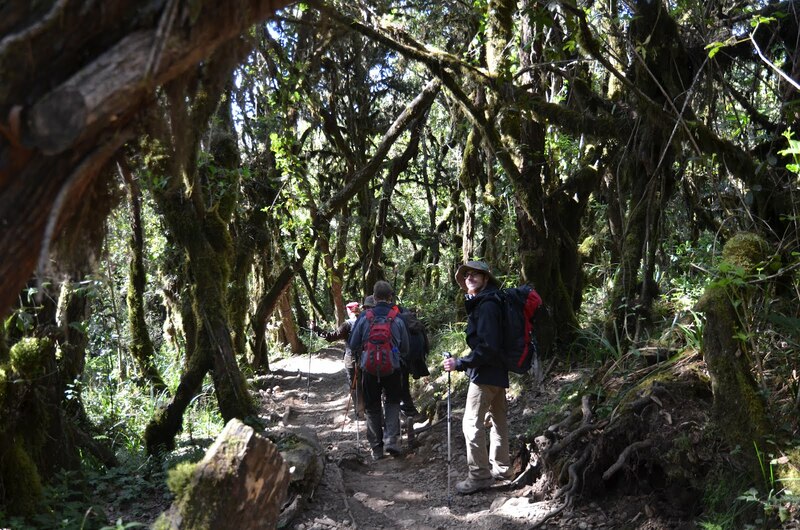 Walking with the help and support of their guides they have already succumbed to exhaustion and altitude sickness. Some are even climbing with supplemental oxygen. 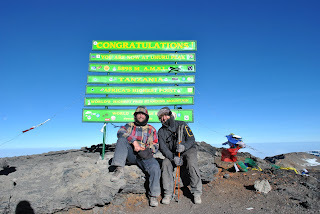 When our lead guide turns around to me at 5500m and asks his regular check up “How are you doing?” my reply is “Never better”. It’s the truth. It’s a highly emotional moment for me, with tears in my eyes. I have just realized I’m likely gonna make it. Without much trouble too, up to this point I’m still breathing exclusively through my nose. A full moon hanging over the glaciers in front of me. A fantastically beautiful sunrise over a sea of clouds behind me. Icy strong winds ripping at my face. Body working at maximum efficiency, every step a minor victory. It’s beautiful. I’m absolutely loving every second of it. This is exactly where I want to be. Unfortunately not everyone is doing great. Volker is suffering the worst. He’s by far the skinniest of the group and starting the day without a proper breakfast (some cookies) in the frosty wind chilled him quite a bit and sapped up his reserves. 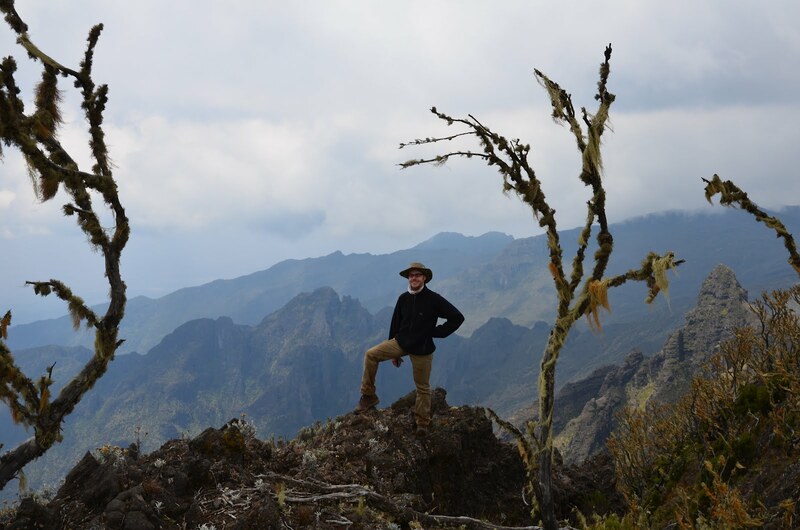 He’s also the only one taking Malaria prophylaxis with potentially strong side effects and unfortunate interactions with altitude. He starts falling asleep while walking (! ), only to wake up when bumping into someone. He’s also getting weird dreams and hallucinations and is starting to lose control of his muscles. We are the slowest group on the mountain and Barty and Alex are starting to get really cold waiting every couple of steps. They decide to separate from the rest of the group and charge ahead to get warm. Before long Barty will pass his daypack to the guide to ease his load on the final stretch. I’m staying close behind Anita who has started to lose feeling in her legs and I carefully nudge her left or right to keep her on the trail when she’s swaying or stumbling too much. No matter. Whatever one may say about our little hodge podge group of armchair mountaineers - we weren’t easily discouraged or lacking in determination. 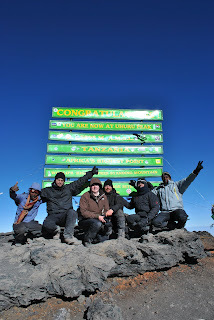 So it is that with extraordinary strength of will all six of us reach Uhuru peak, the highest point of Africa at 5895m! Quite an impressive feat, especially if you consider that this was the first long hike or even mountain climb for some of us. I’m especially proud that Anita as the only girl in the group made it on her own power. 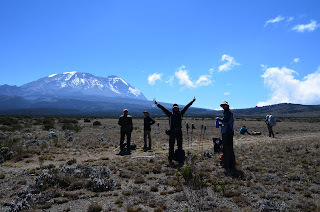 During the trip she grew particularly fond of our second guide Mr Mango who cheered her on with: “Poa poa kichisi kama Anita!” which became a constant meme in our group and means something like “Cool cool like Anita!”. From the summit we did a tour-de-force descent. 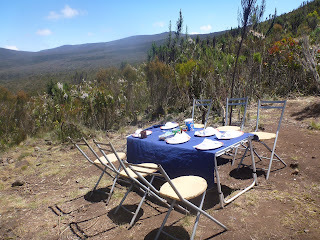 We needed to get down 2800m in order to reach an altitude we were allowed and able to sleep. Babuu took Volker, who was pretty far gone by this point, under the arm and practically teleported him down the mountain, gravel running/sliding back to Barafu camp. We others followed much slower. Since we started our ascent in the middle of the night I didn’t put sun screen on in a timely enough manner and got burned quite a bit even before 10 in the morning. 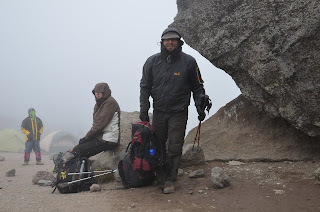 After a short rest in Barafu we started down a direct and very boring route to about 3100m altitude. It was a painfully long trek for Anita who had developed some nasty blisters. At the park exit we were immediately besieged by merchants peddling their wares and people offering to clean our hiking boots. Back at the hotel we invited our guides to drinks. This was a bit of an awkward situation and delicate to handle as we basically drank away their salary for a week that night. We had arranged a wake up call for 3:30 in the morning to get us to the airport in time for our flight at 6:00. From prior experience with wake up calls we expected this not to work. We did good to do so, because it didn’t. Fortunately we had set our own alarms as backup and the taxi was already in the yard with the driver sleeping in the seat. Moshi -> Nairobi -> Amsterdam -> Düsseldorf -> Zürich. After close to 24 hours in transit (2 hours time difference) I arrived home at around midnight and was back at my desk at work in time the next morning. Quite a surreal transition and culture shock. Awesome vacation! Awesome group! Thanks and cheers to the gang!